Today Netflix unveiled a trailer for Marvel's The Defenders. The upcoming series sees Daredevil, Jessica Jones, Luke Cage and Iron First join forces to battle a big bad played by Sigourney Weaver. Cue obligatory hallway fight scene. The trailer has given me an incentive to catch up with a Marvel Netflix backlog. Following the breakout first season of Daredevil. The Netflix series have stalled and stagnated for the most part. Conversely, Legion, a part of The X-Men cinematic universe at Fox, has captured my imagination with its inventiveness and is now front runner for genre series of the year. Stream The Defenders on Netflix from 18th August. Coincedently, that would have been my late mum's 76th birthday. 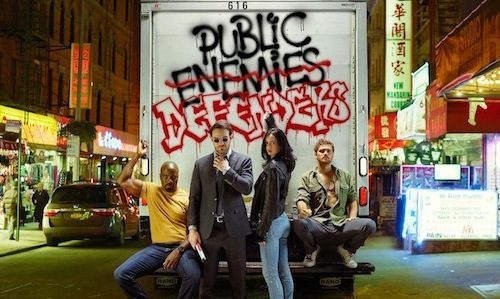 Excited for Marvel's The Defenders or could care less? Let me know in the comments below.